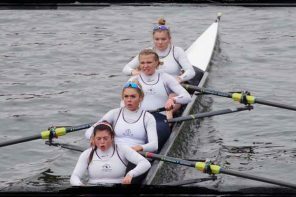 Henley Rowing Club’s senior and junior women’s crews took five wins at one of the UK’s largest single day regattas on Saturday. Wallingford Regatta attracted top crews from around the country to compete on the multi-lane 2km course at Dorney Lake. With near perfect conditions and a slight tailwind throughout the day, Henley competed across a range of boat classes and age groups, with the senior and junior Men’s and Women’s crews up against some formidable competition. The first victory came just after lunch from the junior women’s WJ16 coxed four. 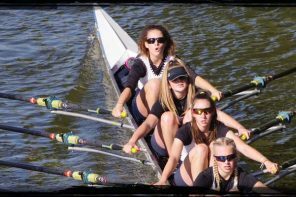 Having won their morning heat easily by 17 seconds, the boat of Lauren Kay, Georgia Edwards, Maisie Turner, Emma Lister, cox Rebecca Lister won in an emphatic time of 7 minutes and 53 seconds, some 6 seconds ahead of the second placed boat from Haberdashers’ School, Monmouth. With heats continuing throughout the day, other junior and senior women’s crews entered all made their way through to finals with easy wins. The penultimate hour of the regatta saw four Henley boats racing, leading to a cascade of Henley Rowing Club wins. The second win of the day came from the WJ16 quad of Lauren Edwards, Maddie Orr, Ellie Thompson and Hattie Orr. With an unbeaten track record, the girls were facing yet more competition from a strong field. By the 1000m mark, the girls had taken the race and led from the front to win in a commanding time of 7 minutes and 4 seconds, a 3 length win ahead of second placed Headington School. The WJ18 coxed four of Ciara Buckely, Kryssie Steiger, Alexis Perkins, Emily Pimlott and cox Beth Pasco had won their morning heat easily, and used this momentum to make a strong start against the five other finalists. Winning in a time of 7 minutes and 39 seconds, the boat were a strong 8 seconds ahead of the second placed crew from Haberdashers’ School. The WJ15 coxed quad of Ella Morgan, Clare Pearson, Katy Claridge, Florence Wiggins and cox Rebecca Lister were entered in one of the most subscribed events of the regatta, With eighteen crews racing across three heats, the Henley girls showed their superior sculling and laid a very clear marker to the field with a win of over 100m in their heat. Starting well in the final, the crew repeated this performance, winning in a time of 7 minutes and 29 seconds, some 28 seconds ahead of the other finalists. The senior women finished off the day with the fifth win of the day in a closely fought race over the 2000m course. The Elite Club coxed four of Lizzie Cottrell, Rachel Alder, Catriona Kay, Jenny Spencer and cox Beth Pasco had won their earlier heat and were racing against crews from Marlow, City of Oxford, Maidenhead, Trent and Wallingford rowing clubs. 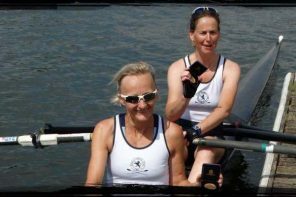 With a winning time of 7 minutes and 46 seconds, the Henley women rowed magnificently in the final 500m to keep Marlow in second place by 2 seconds. In other races, the Henley Mens’ Elite Club coxed four of Andy Pettican, Stan Admiraal, Chris Mitchell, Richard Moody and cox Beth Pasco came a highly respectable third in their event in a time of 6 minutes and 50 seconds. The Men’s Elite Challenge quad of Josh Davidson, Jack Hockley, David Read and Pete Wells achieved a commendable third place in their final in a time of 6 minutes and 28 seconds. The Women’s Elite Challenge quad of Rachel Loveridge, Genevieve Bailhache-Graham, Lizzie Williams and Victoria Carver achieved a good fourth place in a time of 7 minutes and 18 seconds.